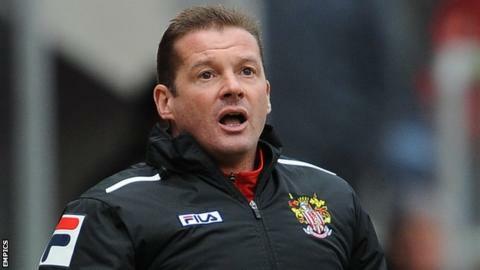 Stevenage boss Graham Westley has called for a sense of realism after they were relegated to League Two. A 3-1 defeat by Bristol City on Monday ended their three-year spell in the third tier. "You've got to remember where you've come from," Westley told BBC Three Counties Radio. "You've got to be humble about your situation and nobody will enjoy this. But in some respects it will be good in putting everyone's feet on the ground." He added: "It is about realising we've got a hard rebuilding job to undertake. I think there were solid foundations put in place this season, but not enough to survive." The loss to Bristol City means Stevenage, bottom of League One, cannot make up the eight-point gap to safety, as they have only two games left. Westley, 46, led the Hertfordshire side out of the Conference Premier in 2010 and secured a second successive promotion the year after to take the club into League One for the first time. He left for Preston in January 2012, with Boro going on to finish sixth in League One, and returned to Broadhall Way 14 months later. But the former Rushden and Farnborough boss has said a lack of quality has seen them drop out of the division. "When you've got technique, it costs a lot of money. If you have technique under pressure, you cost even more," he said. "When you're scratching around for players, your ability to get a few on loan - or a low-cost player with technique under pressure - is going to be limited. "We can be frustrated by what goes on on the pitch, we can all be disappointed. "But when you're playing against sides with defenders who have big Championship backgrounds or strikers like (Bristol City's) Sam Baldock, they're going to have a little more than your lads unfortunately. "Our path has been to find the Bosmans (free transfers), develop the Bosmans and three years later sell the Bosmans."